This horse is an arab black horse. She is not exactly black (I do not know, if I could ever paint really black horse, I like so much many different colours! but you never know!!! ), she has so many colours on her! She is proudly and gracefully walking carrying an apple on her back. Her body looks like sculptured, so beautiful muscles! It is shining on the light! Why is she carrying an apple? It just came on her back. You could think that this is an apple that Eva ate. Did she ate an apple and was there Eva by the way? We could never know. I have not seen her. But I could tell you that this is not that apple. This is an apple symbolizing for me life and natural style of living, natural style of vegan diet, respect to the planet and good vitamins for our body! So the horse should bring this apple to some beautiful special person, I am sure about this! This grey horse is more dedicated and more stubborn. She looks like having to pass through more travels in order to reach her goal, but she is so devoted, that she will get there. 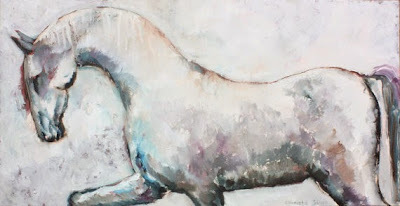 She is like all her sisters graceful, free, kind and generous! I admire her! 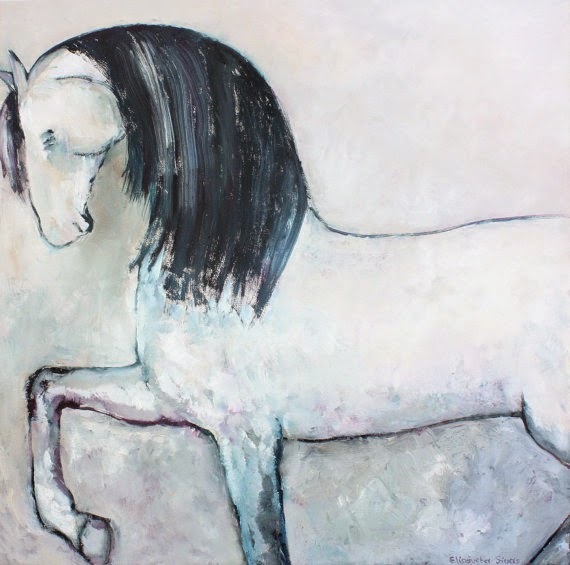 WHITE HORSE with black hair. She is proudly walking to reach her goal. Or may be she has already reached it. Than there is another new goal! 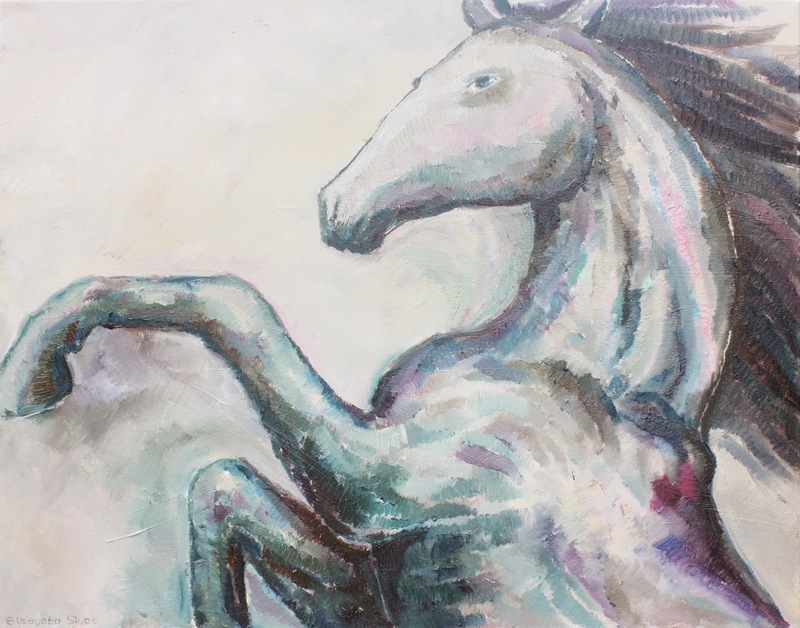 Horses and horses again ... this spring they were coming to me and I was happy to paint horses every day! 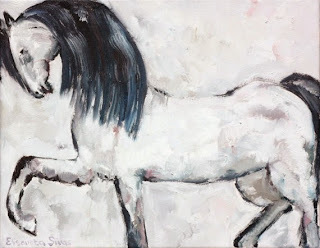 This is a series of white horse with black hair! Victorious Black Beauty, rearing upward, celebrating her freedom and warrior spirit. Beautiful depth, contrast, and blending of colours! Extraordinary artist, amazingly talented! Love it! Wild deer is very graceful and has amazing horns! I have never seen a deer in real nature, only in the zoo. But wish could see in the nature! I have decided not to visit any zoo or circus or animal show any more. I think that animals should be free and happy in their forest where they belong to and we do not have any right to imprison them. When we will understand this, the world will change for sure! So at least I will not pay my little ticket price in order to support animal liberation! This deer is free and of course all my attention was on painting his amazing horns! Such a delight! Hope you like him! This brown horse is running free in the field, I love horses running free, I wish all the horses on Earth are free, and all the animals are free, and people also could be free running like a horse or flying like a bird! I wish to write more, to communicate more these days, wish to find people who resonate with my feelings, with my horses. 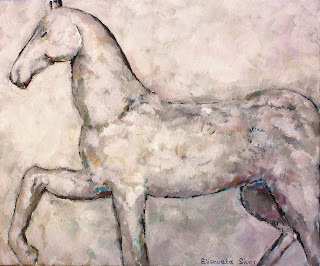 What do you feel when you see my paintings? If you paint, what do you feel when you create? I usually feel a great happiness, a feeling of love and freedom, I want to share all my feelings with other people! I love to have my horses and birds around me on the walls of my home. They are my friends, they keep me company and protect me! 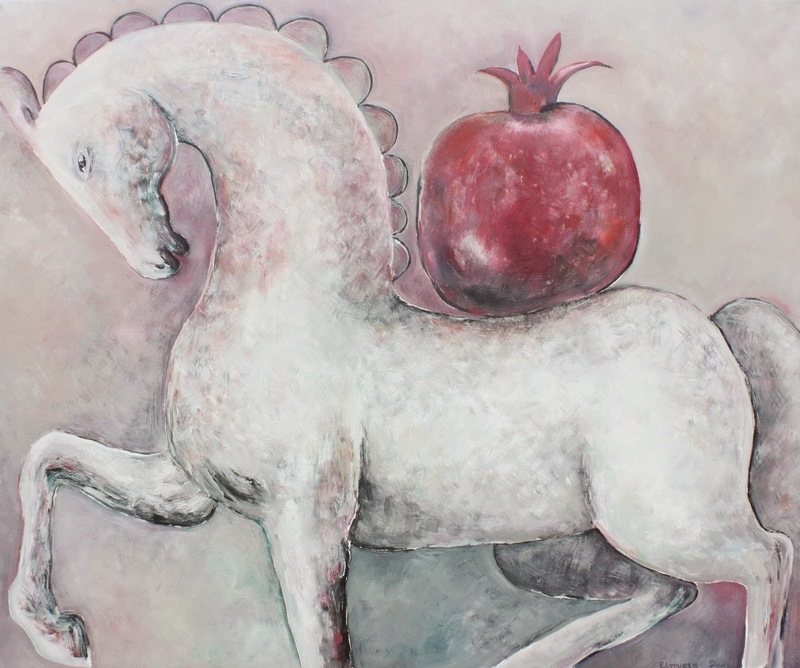 A horse carrying a pomegranate on her back came to my dreams few years ago. 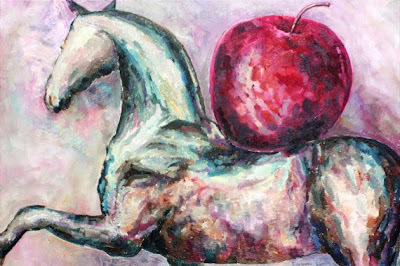 I did not plan it, but while painting a horse, I have decided to paint a pomegranate on her back. 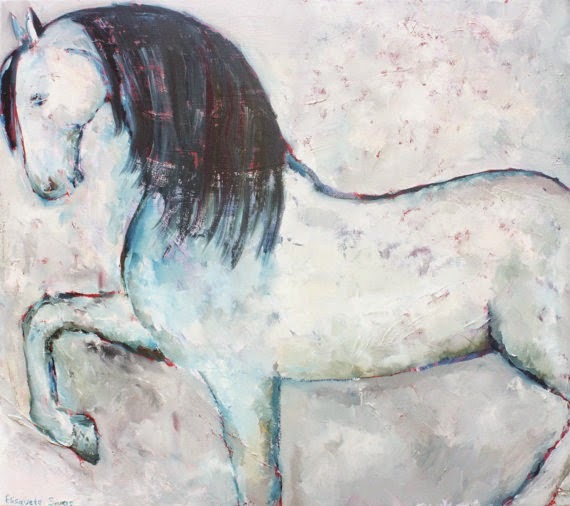 So this horse with a pomegranate is coming again and again to my imagination and asks me to paint her (her.. because all my horses are female horses, I feel them female, I hope they bring more female energy into our world!!) than I saw that a pomegranate is not only a very beautiful fruit, but also symbolizing a lot of things in different cultures, like life, wisdom, prosperity etc. So it comes to be an amazing fruit to appear in my artworks! Hope this horse together with a pomegranate will bring more prosperity, more light, more life into our world! New horses are coming. I paint horses from my childhood. I love horses for their grace, kindness, for their love for freedom. My horses are always walking free and proud to their goal. They will surely arrive where they want to be!